- Publisher One of the most established authorities on leadership writing today, John C. Maxwell speaks to over 350,000 people each year and his most popular topic is THE 5 LEVELS OF LEADERSHIP, which he now shares with readers. 2. Permission - People follow because want to. Through in-depth explanations and examples, Maxwell will describe each stage and show readers how they can move to the next level to become more influential, respected, and successful leaders. 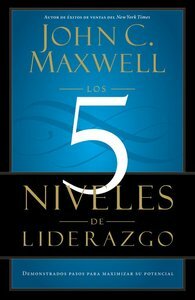 About "The Five Levels of Leadership (Spanish)"
One of the most established authorities on leadership writing today, John C. Maxwell speaks to over 350,000 people each year and his most popular topic is THE 5 LEVELS OF LEADERSHIP, which he now shares with readers.